In a modern office complex in Hilversum, all sleek elevators and glass walkways, are four journalists who know the value of free speech. Deborah Nicholls-Lee went to meet Arash, Basel, Besan and Kowfurow – refugees who were denied the right to speak their mind in their home countries. It is a far cry from fleeing your homeland to working in the heart of the Dutch media landscape, but Arash, Basel, Besan and Kowfurow have been lucky. 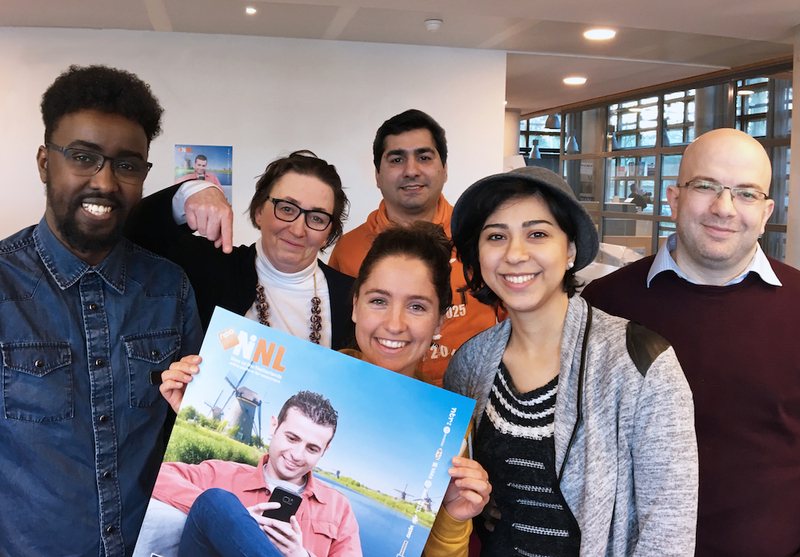 In November 2016 they were selected to be part of an expanding editorial team at Net in Nederland (NiN) a new website that uses subtitled Dutch television to help refugees improve their Dutch and to integrate into their new lives in the Netherlands. The team has already built quite a following on social media among other newcomers who are eager to get help. ‘We have regular customers,’ says Arash Sametipour (40) from Iran, before explaining that the team receives many personal messages from refugees in asylum centres with questions or translations that need to be done. The team collapses into giggles as they tell me about the rising popularity of Besan – their unwitting poster girl – who has a lot of people asking about her. She laughs it off, happy to brighten a refugee’s difficult first months in the country. Net in Nederland, created in April 2016 in association with the Dutch public broadcaster NPO, is a kind of ‘Netflix for Newcomers’, says Kowfurow. It’s a cherry-picked choice of recent television with the needs and interests of the immigrant in mind. There are topical items, such as the Dutch election, and vlogs on subjects like the OV Chipkaart or the healthcare system. The NOS news broadcast on weekdays comes with a choice of Dutch, English or Arabic subtitles. Arash appreciates the open and honest culture in the Netherlands, which allows him to work without censorship. ‘People are straightforward here. They tell what they need to tell. In some other cultures, including my own country, people are not allowed to.’ He left Iran when a disputed election in 2009 led to mass arrests and the closure of many news outlets, creating an impossibly toxic environment for journalists. He found out about Net in Nederland on these very pages: ‘I check DutchNews.nl every day. I noticed that you had written an article about Net in Nederland. I was very excited to find that this kind of platform had begun.’ At NiN, Arash can gain training and earn money while he completes his Masters in New Media and Digital Culture at the University of Utrecht. He moves the subject on quickly and the convivial atmosphere around the table is restored. The cream from the complimentary tompoezen cakes is all over my fingers and I can’t switch off my recording device. I let it play on and the last few minutes are mostly laughter. It tells the story of people who are quite at home and want to help others feel the same. Net in Nederland is an initiative of Dutch broadcasters AVRO TROS, BNN VARA, KRO-NCRV, VPRO, EO, MAX and HUMAN, and is supported by NTR and the NPO. Line up (left-right): Kowfurow, Pamela (English Editor), Jasmijn (Dutch editor), Arash, Besan and Basel.